Happy Wednesday friends! I’m so excited for today’s blog post because it has to do with two things I’m asked about constantly (and also that I really love talking about! ): pregnancy + beauty products. When I first found out we were pregnant, I was honestly pretty clueless in regards to what products, foods, ingredients, etc., to avoid. I knew the obvious ones (alcohol, raw fish, etc) but I quickly learned I had to re-examine everything from my favorite snacks to my skincare routine to even the deodorant I used everyday. 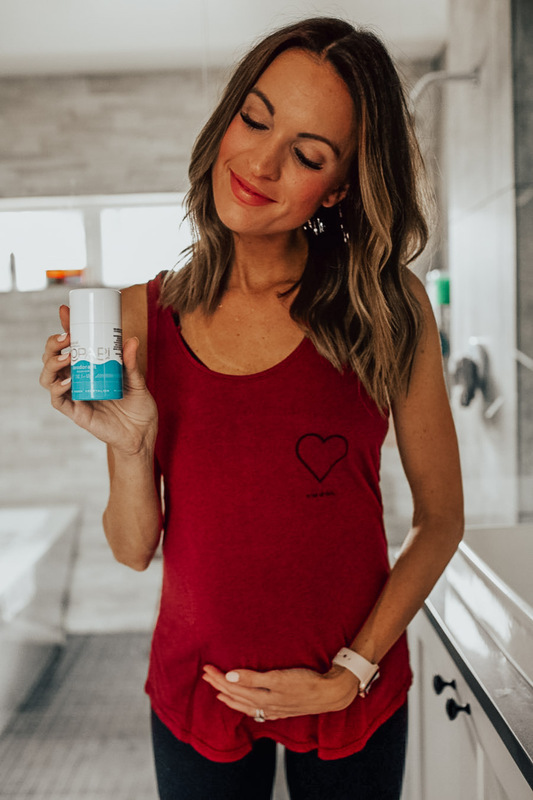 I’ve talked a lot about how I eat during pregnancy and what my skincare routine looks like since becoming pregnant, but today I want to break down why I made the switch to natural deodorant. 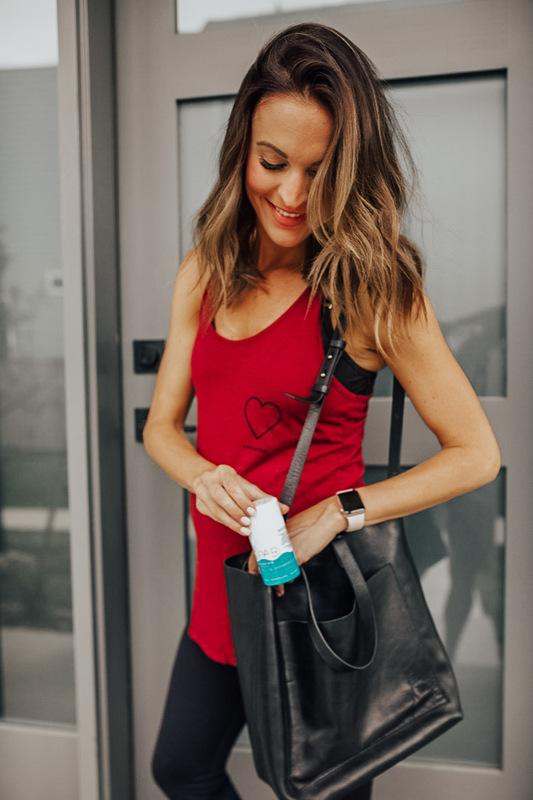 In particular, I want to talk about why I chose Kopari natural deodorant and what my experience has been like since making the switch! As most of you know, I really love to stay pretty active and thankfully that’s remained true for most of my pregnancy (just taking more naps as of late lol). I workout almost every day and my favorite workouts are definitely the ones that work up a good sweat. Side note and maybe TMI, but I am definitely a sweater. Usually when I leave the gym or finish up a spin class, my clothes are just about soaked (just keepin’ it real lol). 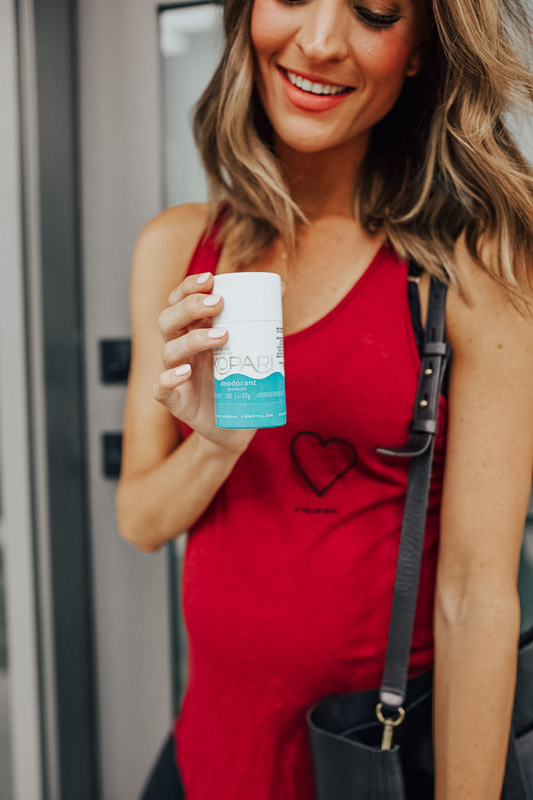 But it’s worth mentioning because when I first started looking into natural deodorant, it was crucial to me that it actually worked and that it could last through long days and tough workouts. I’ve used several different deodorants in the past (both natural and not-so-clean ones) and been super disappointed because they either don’t work or I have to reapply multiple times throughout the day, and so on. And obviously, I refuse to use a deodorant that doesn’t really work. That is one of the reasons why I love Kopari’s natural deodorant: it really works! First off, if you’ve read this post or even saw Monday’s blog post, you know that I’ve been using and loving Kopari products for a long time. I love their natural but effective approach to all things beauty + skin related. So I was super optimistic when I decided to try their deodorant earlier this year, and it definitely did not disappoint. I’ve used it for a quite a while now and have had the BEST experience! It goes on smooth + invisible, and it smells amazing, even after a sweaty spin class (speaking from experience here). I’m an early riser and I usually workout first thing in the morning, and I can honestly say that after applying the deodorant in the morning, it worked all day long for me. No reapplying, no foul smells, no disappointment. If you’re an active girl like me or you’re just looking for a natural deodorant that really works, seriously I can’t recommend Kopari enough. As I mentioned above, a huge reason I switched to natural deodorant is because I’m expecting our first baby in November. I honestly spent a lot of 2017 researching and investing in more clean products, long before I was pregnant. Then when I found out I was expecting, it became even more important to me to re-examine the products I use. The more research I’ve done, the more I’ve learned how important it is to avoid certain ingredients in beauty/skincare products, and this definitely applies to deodorant. Think about it: you apply it everyday, directly to your skin! 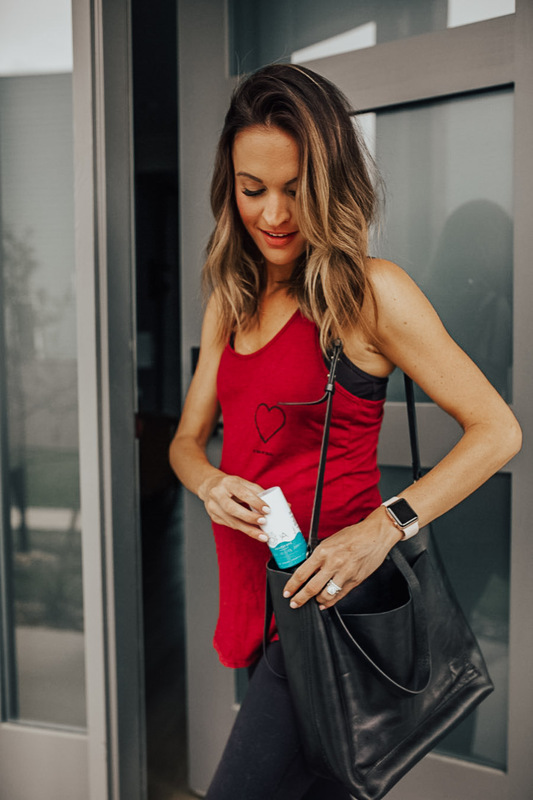 One thing I love about Kopari deodorant is it’s non-toxic, aluminum free and that it’s completely plant-based with amazing ingredients such as coconut water and sage oil. This video is super helpful in explaining more about that, too! 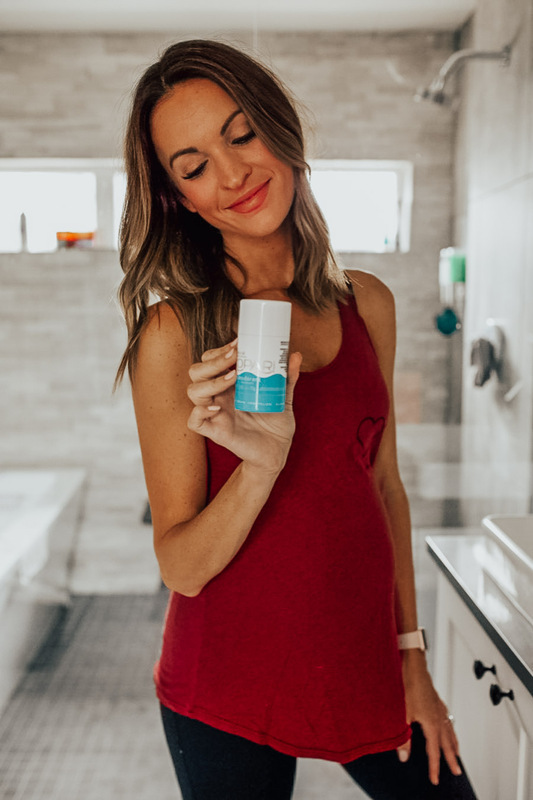 Whether you’re pregnant or not, it’s so important to take these things into consideration, especially when it comes to something you use daily like deodorant. So I love that Kopari natural deodorant provides peace of mind not only because it works, but because it’s not full of harmful ingredients. I’m also excited to share a special discount for y’all on the Kopari deodorant! You can use the code LaurenKaySims25 to get 25% off your first order (or subscription!) of their natural deodorant. I can’t encourage you enough to make the switch! I’ve had such an amazing experience and I’m sure you will too. Thanks for reading! This post was made in collaboration with Kopari. As always, all thoughts and opinions are my own! I’ve tried several natural deodorants and I feel like by the end of the day and especially during/after a workout it feels like I didn’t even use deodorant. So excited to try this one though, just ordered it. Thanks for the recommendation! i totally understand! i’ve had similar experiences, so i was ecstatic when i finally found one that worked well! Love this, and am so excited for you! I bought this deodorant after your post and was very excited to try a new deodorant. However, in my particular case I found it to be super sticky under my arms and was rather annoying. I also bought the lotion and it is very nourishing and smells very nice. I have been using The Fresh brand deodorant for years and absolutely love it but I know it is probably not a natural deodorant. Just ordered! Can’t wait to try it!